Just in, news from Mora of Sweden that the military green version of the new 2010 is going into production. 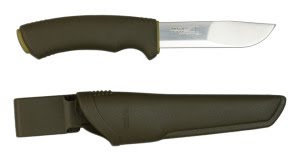 The 2010 uses the same stainless steel blade as the popular Mora 2000 but has a more ergonomic handle with a finger guard and small ridged areas for extra grip with a variety of holds. The handle is made from a similar material to our Gyokucho Eva grip saws - a hard plastic that feels soft to the touch and is amazingly grippy, even with wet hands. As a general purpose knife I reckon they have got these just about spot on, the scalloped tip means you have a strong blade for heavier work but a fine, slightly flexible tip. We are be among the first companies in the world to stock the civilian version of this knife and will have the military version in stock as soon as the first batch are finished.